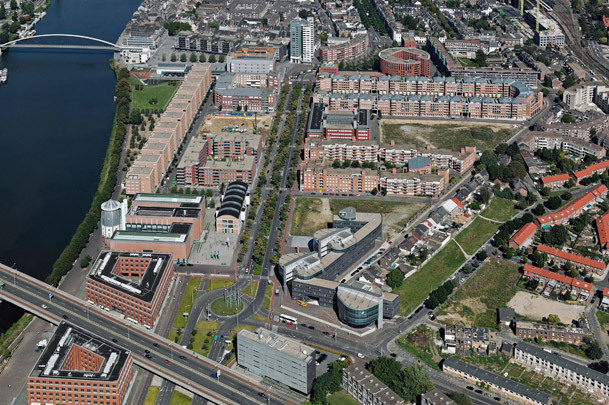 This housing district occupying the site of a former ceramics factory was masterplanned by Jo Coenen. Marked by a layout of perimeter blocks, the plan’s architecture has been entrusted to an international galaxy of name architects. Chopping the plan in two lengthwise is the Avenue Céramique, along which stands the new Bonnefanten Museum. The sole survivor of the original factory is the so-called ‘Wiebenga-hal’, a workshop of reinforced concrete with a shell roof designed by the structural engineer Jan Wiebenga in 1912 and now serving as exhibition space. After a shaky start the buildings came thick and fast. At the area’s core is Coenen’s own Centre Céramique. Acting as an intermediary between the new-build and the old town, it contains the public library, the municipal archives and a theatre plus café. A handful of office buildings assemble in the southern portion along the ring road.